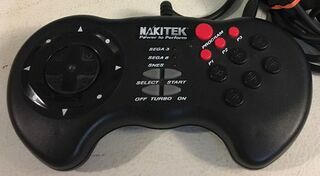 The Control Pad is a third-party controller for the Sega Mega Drive, created by Naki. It is a six button controller with turbo features. It has four additional programmable buttons and a combined MD/SNES plug. The next version of Control Pad is Turbo Touch 360+ which has a touch panel instead D-Pad.